When you are looking at lights for the bathroom, you need to consider in which bathroom lighting zones you will place your lights in order to avoid mixing electricity and water together. Below you will find the guidelines set out by the IEE Wiring Regulations. Bathrooms are divided into three lighting/humidity zones. The closer your light is to the water source, the higher the risk of getting the light wet. This in turn means the higher IP rating fitting you will need. Zone 0 Inside bath or shower itself. Fitting must be IP67 or greater. Zone 1 Above the bath or shower to a height of 2.25m. Fitting must be IP44 or greater. 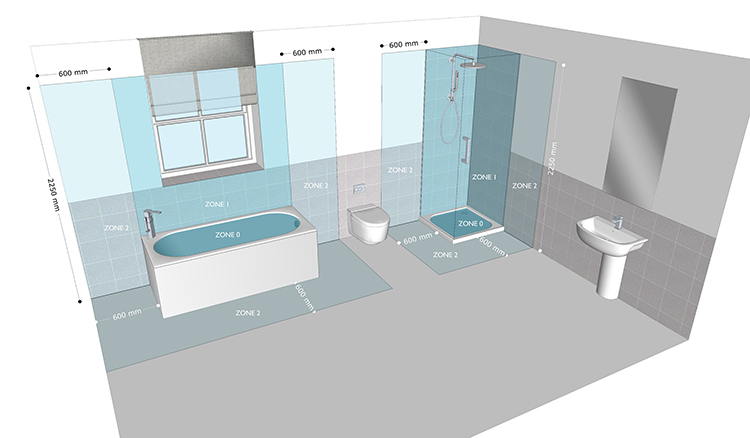 Zone 2 In an area stretching outside of the bath or shower by 0.6 metres wide and the area outside of the 2.25 metres directly above the bath or shower. This zone also covers the area directly next to Zone 1, all around Zone 1. Fitting must be a IP44 or greater. What do the numbers for IP rating mean? Perfect products for bathroom lighting Zones 1 and 2, for general bathroom IP rated downlights are the directional Aquabeam IP Rated LED Downlight and fixed Waterspring IP rated LED Downlight. Alternatively for a bathroom IP rated uplight choose the Torino LED Uplight and Lucca LED Uplight. Ideal IP rated products for bathroom task lighting are the Bathroom Wall Light, Wilton Bathroom Light, Bari Bathroom Light, Kyoto Bathroom Light, Penne Bathroom Light and Grissini Bathroom Light. Are you looking to changing your bathroom lights or designing your new bathroom? Give us a call on +44 (0) 20 7371 9000 to find out more about IP ratings and bathroom lighting zones or talk through your design ideas. Looking for more inspiration or tips?